Autism is a neurodevelopmental disorder first described by Leo Kanner in 1943 as early infantile autism. Since this early recognition, many terms have been used to describe the condition including autism spectrum disorder (ASD) in the Diagnostic and Statistical Manual of Mental Disorders-V and early childhood autism in the International Classification of Diseases-10 (ICD-10)., ASD is now the widely accepted term and will be used in this article. According to Ahlquist, ASD affects approximately 1 in 68 children. It involves global impairments in communication, regulation of behavior, and changes in sensory perception. While little is known about the underlying neurobiology of ASD, it has been noted that sensory processing is affected in autistic individuals; they may be oversensitive or undersensitive to certain modalities. These difficulties are enhanced during the periods of transition; the ICD-10 states that children with autism tend to ”impose rigidity and routine on a wide range of aspects of day-to-day functioning” and for this reason find periods of change very challenging. 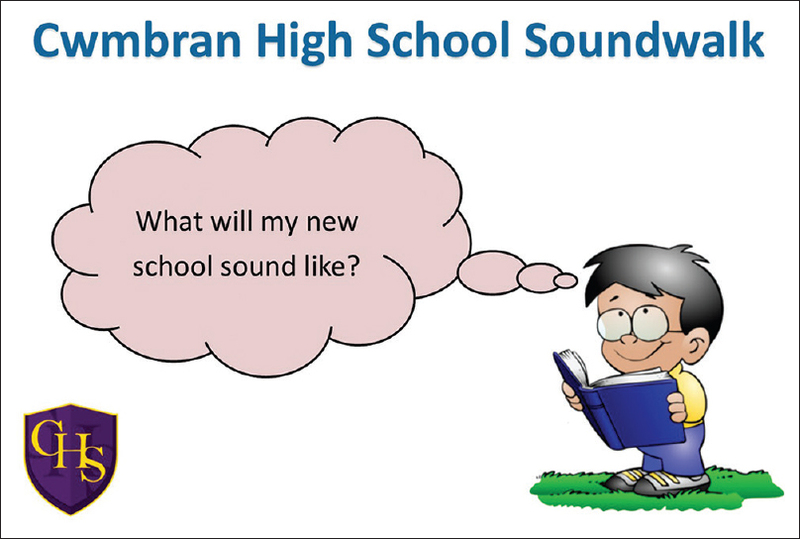 Transitioning from primary to secondary school has been recognized as a hurdle for children with ASD; therefore a new, sound-based transition resource had been developed by the team to support this transition (http://www.wales.nhs.uk/sitesplus/866/page/91136). 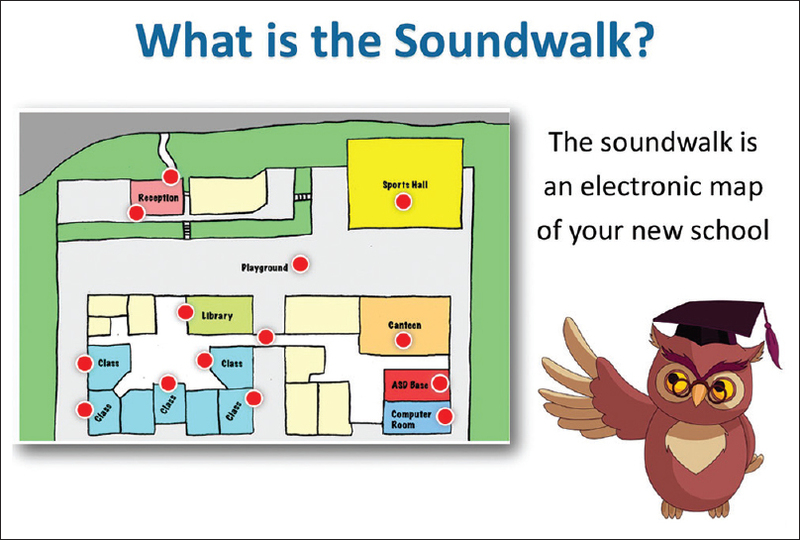 The ”sound walk” is a free interactive, electronic map of a generic secondary school which children can use to listen to the sounds they will hear in their new high school environment. The sound walk helps to desensitize the children to some of these new sounds and can be used before their visit to the high school. It is designed to help support transition from a usually smaller, quieter environment of primary school into a busy secondary school. This article will discuss the development of a ”sound walk guide” which was developed along with children with autism and professionals from education and health. It is to be used alongside the free ”sound walk audio tool” to maximize its effectiveness. A literature search was conducted using Web of Science, Google Scholar, and JSTOR. The following two main search terms were used: ”transition tool autism” and ”sensory perception in autism,” with the search limited to the years 2005–2018. Seven acceptable articles were found which were all from 2017 to 2018, these all gave information on transition tools currently available for children with autism. The limitations of the search were that many of the studies focused on transition from secondary school to college and college to university; however, these could still be applied to the context of the primary to secondary transition. There were some additional articles that appeared relevant to the search; however, full access to them was not available and therefore they were excluded from this article. In addition, a chart review of 200 children was excluded as the data were from 1997. Another study comparing transition resources for attention deficit hyperactivity disorder (ADHD) versus ASD was excluded as it was an American article and the ADHD diagnostic criteria in America differs from that in the UK. Therefore, only strictly relevant, up-to-date information was collated. 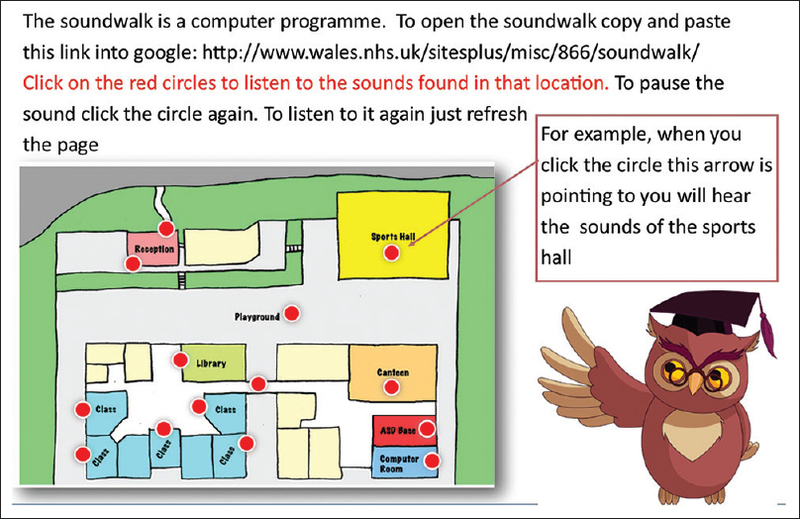 The sound walk audio tool is available free on the internet (http://www.wales.nhs.uk/sitesplus/866/page/91136). 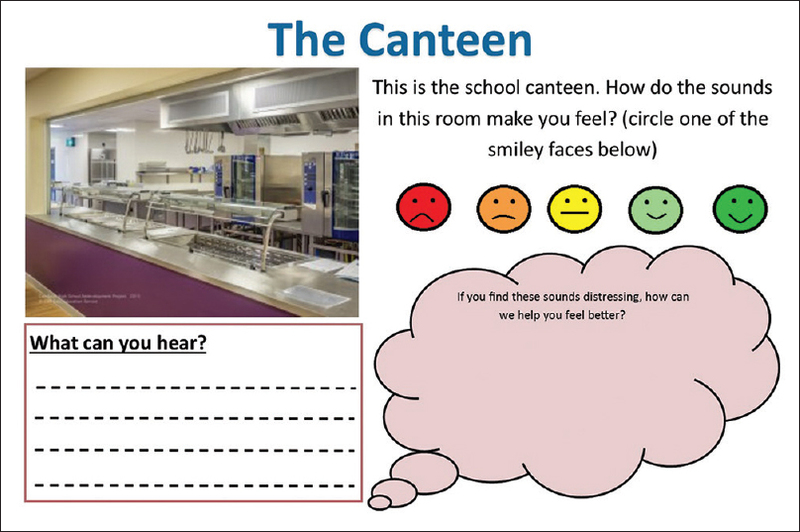 To develop the sound walk tool, sounds were gathered in the school at different times, for example, in a classroom, at break time, and in the canteen. Binaural audio recording (record sounds in three dimensions (3D) which are as close to the actual experience of hearing as possible) was used in this process. The sound marks were plotted on the visual map of the school to develop the sound walk. 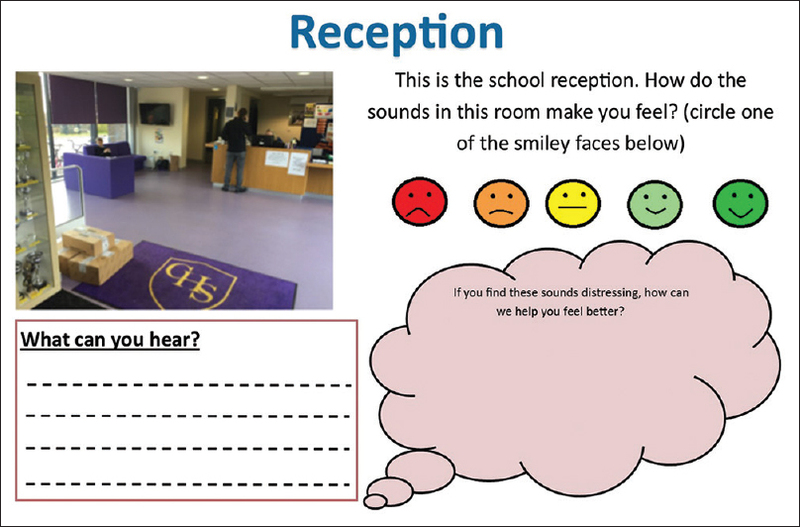 This sound walk is best heard with headphones as it takes the listener on a 3D tour of the school. A sound walk guide for the audio sound walk tool was developed using ”Microsoft Publisher.” A standard color scheme was chosen. Using a consistent layout, a set of pages were then designed for the children to work through according to each room found on the sound walk map. Later on, a page was added with a short story of a school child on the day before he/she started secondary school. 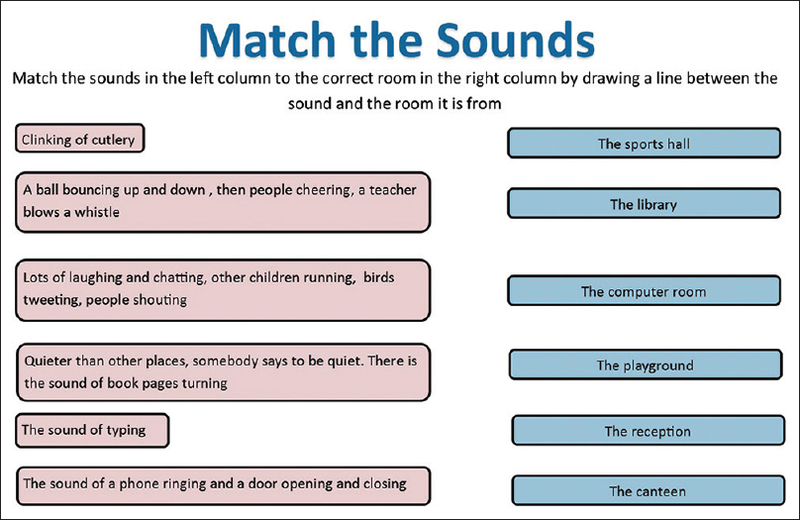 To make the sound walk guide more interesting and interactive, an activity page was added for the children to match the sounds to the rooms they visited. The review of literature highlighted a variety of transition tools available for autism including ”novel smart-glasses” and online technology-aided programs. A systematic review conducted in 2018 examined eight separate studies to assess the effects of different interventions in college students with ASD. Among these was an online psychosocial training program targeted at young people with ASD leaving college. It showed a potentially positive outcome for those taking the transition program; however, the researchers noted that their assessment was limited, not considering individual aspects of the program or the academic status of the participants with ASD prior to taking the program. Another article in the literature focused on a transition planning program for adolescents on autism spectrum. The Better OutcOmes and Successful Transition for Autism (BOOST-A™) is an online program aimed at young people on autism spectrum who are leaving school. A process evaluation of the BOOST-A™ evaluated the effectiveness, usability, and potential reasons for failure of the program. It concluded that the tool was beneficial to some but not to others. This highlighted the importance of a range of tools being available for those with autism. Children with ASD often present differently and therefore their response to interventions is also often different. Many of the transition tools described in literature had been developed for young adults between secondary school and college and between college and university. These largely included summer camp transition programs which helped young people learn skills required for independence. Hotez et al. described the use of an interactive participator approach to design a free summer transition program for incoming college students. The literature search also highlighted other sensory aids used in ASD such as the Augmented Reality smart glasses which allow people with ASD to use virtual reality in order to experience different visual and auditory environments. These are well tolerated and easy to use; however, they are very expensive and therefore are not widely available. However, till date, there has been no literature to show any similar programs or transition tools for younger children between primary and secondary schools. This emphasized the need for developing the sound walk guide as a transition aid between primary and secondary schools. The literature review highlighted the lack of transition tools available for children with ASD undergoing transition from primary to secondary education to help with this. Most of the available transition tools are aimed at young people leaving college or high school. The sound walk guide will be a transition tool specific for children between primary and secondary schools and a much-needed resource. Some sample pages from the sound walk guide are depicted in [Figure 1], [Figure 2], [Figure 3], [Figure 4], [Figure 5], [Figure 6]. Download sound walk on your device → Use headphones to hear the sounds → Press red dots on map to hear sounds → Visit the different areas in school → On the sound walk guide, write what sounds you hear, how the sounds make you feel, and what can be done to make you feel better. You may want to play the match the sound game at the end of the guide. We would like to thank the students and staff at the ASD Base, Cwmbran High School. Barker P. Basic Child Psychiatry. 6th ed. Oxford: Blackwell Science; 1996. World Health Organization. ICD-10 Classification of Mental and Behavioural Disorders. Geneva: World Health Organization; 1992. Ahlquist S. Sensory playscape: Advanced structural, material and responsive capacities of textile hybrid architectures as therapeutic environments for social play. In: Menges A, Sheil B, Glynn R, Skavara M, editors. Fabricate. 6-8 April, 2017. University of Stuttgart, Germany, London: UCL Press; 2017. p. 234-41. Robertson CE, Baron-Cohen S. Sensory perception in autism. Nat Rev Neurosci 2017;18:671-84. Greenspan SI, Wieder S. Developmental patterns and outcomes in infants and children with disorders in relating and communicating: A chart review of 200 cases of children with autistic spectrum diagnoses. J Dev Learn Disord 1997;1:87-141. Elias R, White SW. Autism goes to college: Understanding the needs of a student population on the rise. J Autism Dev Disord 2018;48:732-46. Kuder SJ, Accardo A. What works for college students with autism spectrum disorder. J Autism Dev Disord 2018;48:722-31. Hatfield M, Falkmer M, Falkmer T, Ciccarelli M. Process evaluation of the BOOST-A™ transition planning program for adolescents on the autism spectrum: A Strengths-based approach. J Autism Dev Disord 2018;48:377-88. The National Autistic Society. Autism: What is Autism? UK: The National Autistic Society; 2016. Available from: http://www.autism.org.uk/about/what-is/asd.aspx. [Last accessed on 2018 Apr 14]. Hotez E, Shane-Simpson C, Obeid R, DeNigris D, Siller M, Costikas C, et al. Designing a summer transition program for incoming and current college students on the autism spectrum: A participatory approach. Front Psychol 2018;9:46. Keshav NU, Salisbury JP, Vahabzadeh A, Sahin NT. Social communication coaching smartglasses: Well tolerated in a diverse sample of children and adults with autism. JMIR Mhealth Uhealth 2017;5:e140.